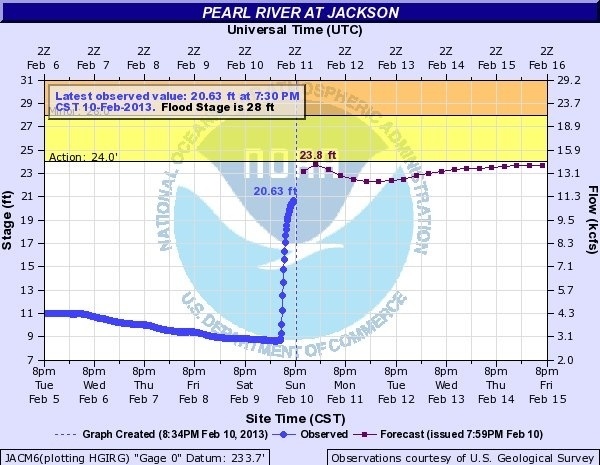 The above graphs demonstrate the present high level of the Pearl River at Jackson. The first graph shows a dramatic increase in water levels on the 9th. The second graph shows present levels (as of February 13, 2013, at 1:25 p.m.), along with forecast levels. Below is a copy and paste of the National Weather Service Flood Warning affecting our area. 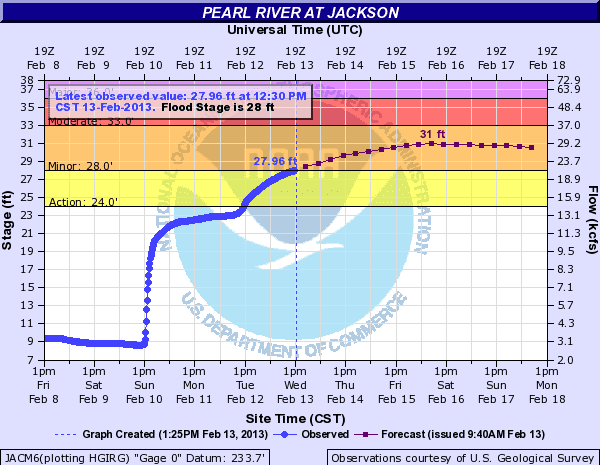 THE FLOOD WARNING CONTINUES FOR THE PEARL RIVER AT JACKSON * UNTIL FURTHER NOTICE. * AT 9:30 AM WEDNESDAY THE STAGE WAS 27.7 FEET. * MINOR FLOODING IS FORECAST. * FLOOD STAGE IS 28.0 FEET. * FORECAST... THE RIVER WILL RISE ABOVE FLOOD STAGE BY THIS AFTERNOON AND WILL CONTINUE TO RISE TO NEAR 31.0 FEET BY SATURDAY MORNING. * IMPACT... AT 30.0 FEET... WATER BACKS UP INTO SEVERAL CREEKS AND STREAMS IN THE JACKSON AREA. WATER IS UNDER SOME HOMES NEAR THE RIVER IN THE BYRAM AREA. * IMPACT... AT 29.0 FEET... 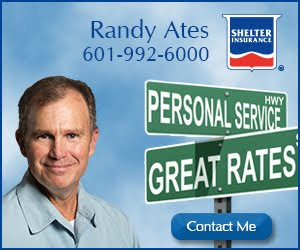 FARMLAND IN SOUTHERN RANKIN COUNTY BEGINS TO FLOOD AND WATER BEGINS TO AFFECT HOMES NEAR THE RIVER IN THE BYRAM AREA. * IMPACT... AT 28.0 FEET... MINOR FLOODING OF LOWLAND NEAR THE RIVER IS OCCURRING. WATER BEGINS TO BACK UP INTO SEVERAL CREEKS AND STREAMS IN THE JACKSON AREA. Thank you, Marty. Graph updated. and people want to build lower lakes and develop property along it... Crazy!